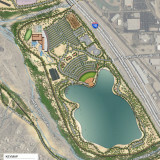 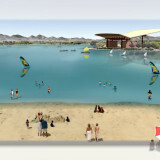 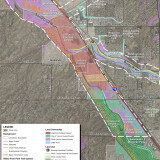 The Corazon de los Tres Rios del Norte Recreation Master Plan creates a vision and establishes alternatives for future recreation, flood risk management, groundwater reclamation and environmental restoration at the intersection of the Rillito River, Santa Cruz River and the Cañada del Oro Wash. 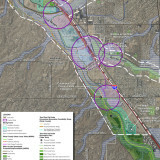 In a joint effort between Pima County Flood Control District, Town of Marana, City of Tucson and the U.S. Army Corps of Engineers, a study was prepared to identify whether there is federal interest in implementing a project along the Santa Cruz River. 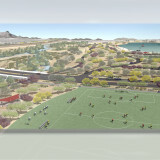 In an effort to broaden the appeal and benefits to the greater Tucson community, an ambitious regional recreation component was created to enhance the original reclamation and restoration project. 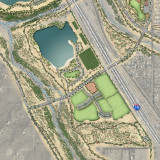 The Planning Center provided support to Pima County in the preparation of the Master Plan by analyzing the area’s physical opportunities and constraints using geographic information systems (GIS), rendering conceptual site plans and creating visual simulations of proposed design elements.